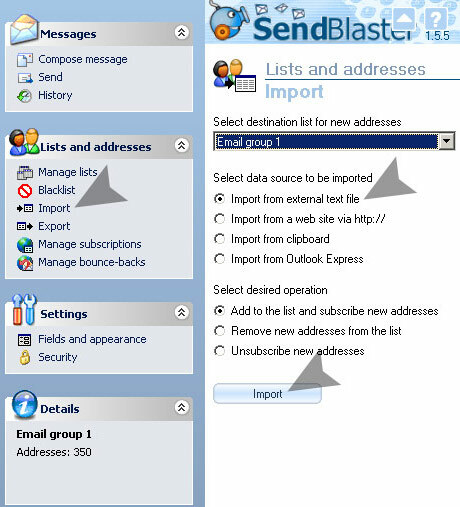 SendBlaster Bulk emailer directly imports your mailing list email addresses and contacts from Outlook Express. You can import email addresses lists from Outlook, Excel, Access and any other source that can export mailing list contacts into CSV file format. You will have to tell SendBlaster where in on your computer the CSV file that you want to import. Importing CSV and TXT files is complete, you will find the imported email addresses and contacts in your Manage Lists section. In the bulk email software, this is the final importing window with subscription summary.